A printer driver is a program that knows how to print correctly to a specific printer model. Installing a printer in Microsoft Windows means installing a printer. 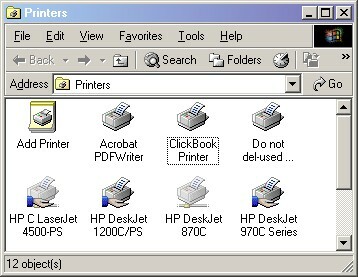 To set up a printer in ClickBook, you run ClickBook's Printer Setup, which creates a "ClickBook Printer". When you print to the "ClickBook Printer", ClickBook intercepts the print pages from your application program. After formatting the print data to fit the layout you choose, ClickBook sends it to be printed by your regular printer driver. ClickBook does not alter your printer's driver in any way.